I know that most tank owners create an ambience with lighting so that at some point, it is low and/or diffused, that allows fish to rest. Since fish do not have ‘eyelids’ like you and I, I often wondered if and how fish sleep especially during those low-light tank times. Sleep to a fish is when they reduce their activity and metabolic rates. Once this happens, they seem to ‘float’ or hover in place like dancing seaweed. Sometimes they seek out a ‘safe’ spot – like burrowing in mud or among corals. It’s like finding a suitable nest so they can perform restorative functions, similar to a human’s need for daydreaming. Just to be still and quiet for a time helps reduce stress and even in their quite times, they are always on the lookout and ready should danger or predators approach. My next thought is do fish drink the water that they are swimming in. Freshwater fish live in water that is less salty than what is found inside their bodies. So they need to intake small amounts of water by osmosis through their tissues. Saltwater fish live in water that contain larger amounts of salt than what is found inside their bodies. They must take in larger amounts in order to live. Both fish drink water in order to equalize their bodies to their surroundings. Do fish have a hearing? Now I begin to wonder if fish can hear or detect sounds. We’ve all tried to catch a fish with our bare hands at one time or another without success. Think about the mechanics of a school of fish. They act in mass by swimming in the same direction and when one changes, they all change. Why? They coordinate their movements using the flow of water across their lateral line system. Any change in direction changes the flow of water, and then passes on to the next fish, and the next, and the next. Why do fish behave oddly? 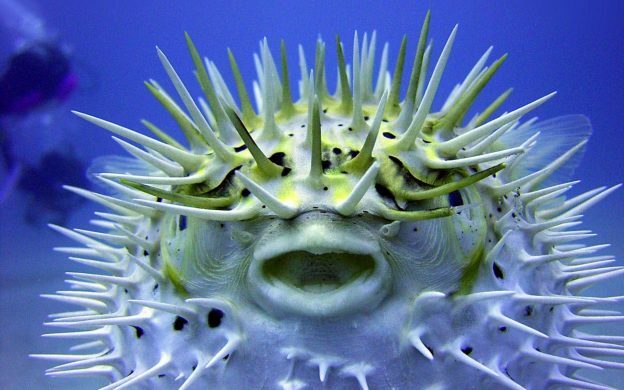 Finally, have you ever seen fish act ‘funny’ or display some ‘odd’ behaviors? If a fish flutters its fins or quivers and shakes in front of another fish, they use that as a defensive behavior. 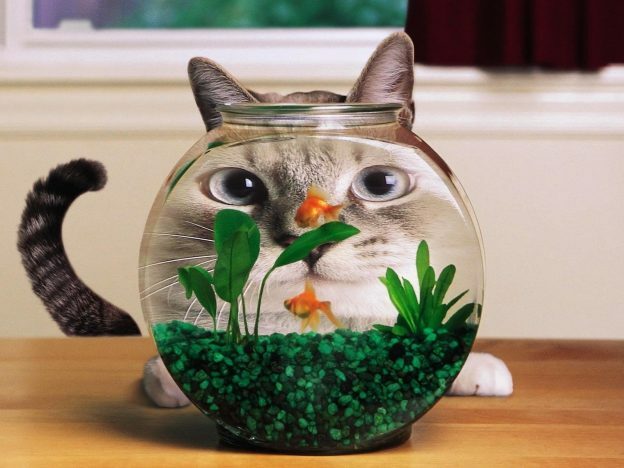 Fish can show submission as well. They either lie on their sides when another fish comes towards them, or they float motionless in a heads-up position. For those of you that have wrasse or parrotfish in your tanks, they often scratch or bank their heads on a piece of coral. It’s not serious – just a way to help remove clotted salt from their gills. If other fish species do this, then they may be showing signs of having parasites or your water pH levels are too low. Some fish, like Catfish, Gobies, Triggers and others dig ‘pits’ in your gravel. This is their natural instinct for building a home, just like they would do out in the open waters. Gnawing on your coral? Wild Parrotfish are known to eat corals, and Triggers may use corals to sharpen their teeth. If you want more help in coming to know your fish and making sure they stay healthy, call Seatech Aquariums today! Seatech caters to all types of clients – from large corporations to individuals with home aquariums. Jimmie and Mike will be able to help you figure out a plan, get started and enjoy your aquarium for years to come. Need an aquarium check-up? Then Jimmie is the go-to guy. He will come out, assess your aquarium, make suggestions, and get your tank clean, sparkling, and well-maintained. Don’t let your aquarium suffer the blues!! Let Seatech create the beauty of the ocean right in your own home. This entry was posted in Fish Facts, Industry News and Tips and tagged aquarium, aquarium expert, Aquarium Maintenance, aquarium phoenix, aquarium setup, coral, coral reef, Coral Tanks, facts about fish, fish, fish expert, fish fact, freshwater fish, freshwater tank, phoenix aquarium maintenance, phoenix aquarium setup, reef, Reef Aquarium, saltwater fish, saltwater tank on January 26, 2015 by admin.